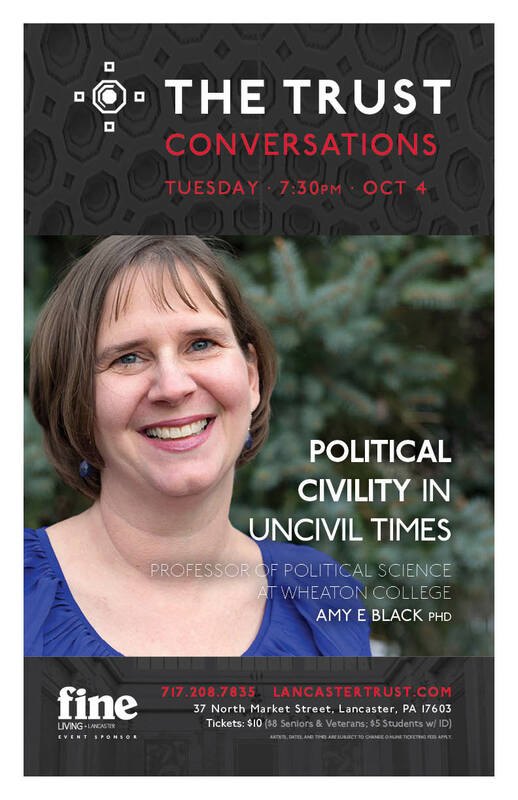 Amy Black, PhD, Professor of Political Science at Wheaton College, joined us in a partnership with The Trust Conversations on Sept. 9th, 2016. Having lived in Lancaster and taught at Franklin & Marshall College, speaking for us was a kind of homecoming. She commented a few times that it was a joy for her to meet up with new friends and see our fair city making strides. Her talk, Political Civility in Uncivil Times, drew a good-sized crowd to the "black box" in the Trust. I was impressed with her energy. This is a woman who is married to a professor, has an eight year old child, and who stepped off a plane, ate dinner with us, and launched right into her lecture. She spoke with clarity, buoyancy, and humility. And she kept up the conversational pace the next morning by participating in LBC's chapel service, having lunch with undergrads, and drinking tea with Becky and me in our home. I then had the privilege of driving her back to Harrisburg International Airport. In that cockpit discussion, I brought up MLK, Jr.'s take on civility in the public square, particularly his Letter from a Birmingham Jail. (I failed to get that question in the night before; Q&A was quite earnest!). In keeping with one of her main points, that the ground rules for civility fluctuate with our times, she remarked the civil rights leader would have been seen as uncivil at the time. Our prevailing, admittedly white-dominated, culture balked at his rhetoric. Even though King spoke, wrote, and acted in non-violence, his aggressive stance certainly seemed "not nice" to many. Sadly, many of those disturbed by his prophetic voice were white church leaders who just wanted civil rights to emerge in its good ole time. Don't we do the same thing when civil entreaties for justice go unheard simply because they upset our lust for "personal peace and affluence?" (Francis A. Schaeffer, The Church at the End of the 20th Century). Today, uncivil means something like disparaging remarks toward any particular group that our culture now desires to protect. Seems downright lying, meanness, and bullying, though cracked-down on in middle schools, is not a problem on the political playground. I had to laugh at the eleven year old NBC video that "surfaced," depicting Donald Trump's thumping on women. Has anyone been listening to many of us who have been grossed-out by his bullying, sketchiness, and demagoguery for the past 30 years? As Black pointed out, culture shifts, and often, politics sit downstream from culture. This is why The Row House exists: To cultivate Christ-energized culture that will make a difference in all streams of current culture, not just politics. Another helpful part of her talk was to remind us that politics itself invites disagreement. So, incivility will always be crouching at the door when fallen humans start taking about what's right for everyone. Debate and compromise is what that the American experiment does so well, but it's just easier to vilify people and ram agendas down throats. The Christian has a playbook for civility called the image of God, Black reminded us. Every person we deal with is crowned with glory and honor (Psalm 8) whether they agree with us or not, whether they insist on their own destruction, or whether they prefer a flat tax or a graduated tax rate. At the end of the day, law makers and little people like the rest of us should be able to lift a pint, get a good night's sleep, and get back to work on stewarding God's creation. Such labor is a high calling. I heartily commend to you Amy's recent book, Five Views on the Church and Politics (Zondervan). It's super helpful for gaining wisdom and respect for engaging with others within the Church, but it also demonstrates the kind of listening and give-and-take all people should participate in outside those walls. Forget Amazon for a second: I'll send you Amy's book, direct from Hearts & Minds Books, if you become a Row House Member for $10 or more a month. Email me below, and I'll set you up!